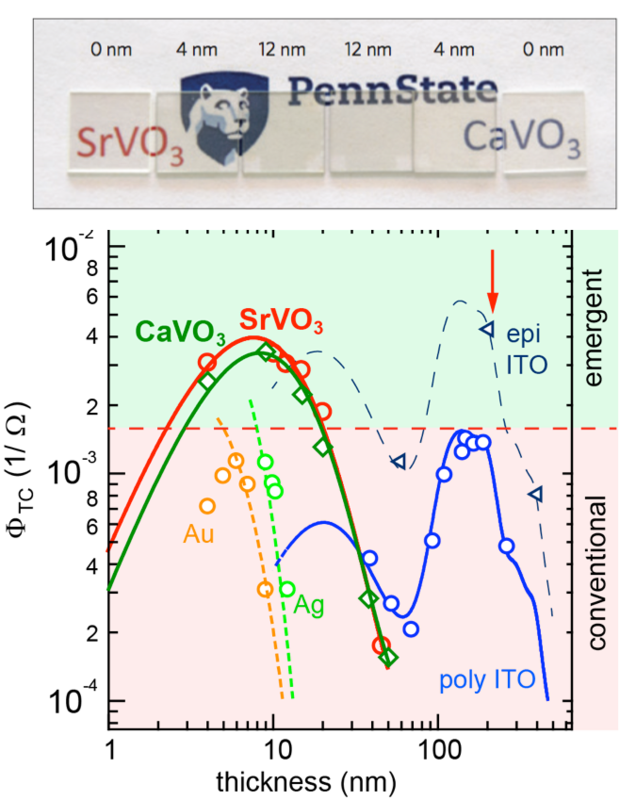 Correlated-metal SrVO3 and CaVO3 films on transparent substrates are superior in their figure of merit for transparent conductors, on par with Indium Tin Oxide, the material used in current displays. Transparent conductors are materials that are transparent in the visible spectrum and electrically conducting. Indium tin oxide (ITO), the current commercial transparent conductor is based on the paradigm of starting with a transparent semiconductor and degenerately doping it to increase its electrical conduction. Here, MRSEC researchers have proposed an alternate paradigm, namely, to begin with a metal that has superior electrical conduction to ITO, and by by exploiting electron correlation, push the plasma frequency below the optical transparency window to open up transparency in the metal. The figure of merit – optical transparency divided by the electrical sheet resistance – is as good or better than ITO, as shown at right. This work has received considerable attention from the industry, (Konica, Minolta, Murata), and has led to U.S. Patent Application No. 14,815,546 and PCT/US2015/043274 “Novel Transparent Conducting Films/Perovskite Oxide”.